As I write this, I can practically hear the refrain from that 1984 Band Aid concert “Do They Know It’s Christmas Time?” playing in my head. And I certainly do know that. The gifts are wrapped here and the ingredients for pasta bolognese are ready for Christmas Eve dinner. I hope every one of my readers gets the opportunity to engage in the festivities and rituals they and their loved ones also cherish at this unique time of year. I am going to just play mom, chauffeur, and cook through the New Year after this post although I will likely keep the conversation going in the comments. But two important admissions that clarify what has been going on and what we will likely encounter in 2014 and beyond globally have come my way. This post is just a head’s up, and a reminder that there is a language involved with all these transformational intentions, we now speak it, and we can correctly translate and appraise Whatever comes our way in 2014 in both education and social policies generally. Clarity is always something to be grateful for even if it does not come in a box with pretty paper and a bow. Some of it did come, however, on this slideshow that arrived in my email to Wish Me a Happy Winter Solstice. http://www.slideshare.net/TheHappinessInitiative/personal-happiness-handbook-25-actions-along-10-domains-of-happiness I suppose longer days of daylight from now on is something to celebrate, but you will find quite a bit of meddling about what is supposed to make us “happy” going forward. Very much grounded in communitarianism as so much else seems to be these days. We had already noted in previous posts that the UN started a World Happiness Report in 2012 and the OECD has been pushing Subjective Well-Being as a means of aiding its Great Transition emphasis. GT also has its own posts, but briefly one of our 2013 discoveries is a shockingly widespread political belief that it was always the West, not Russia or China, that actually met Karl Marx’s criteria of the high level of technology produced by capitalism (in our case computers and broadband and ICT generally) that would be necessary to achieve his envisioned little c communism stage of human development -“From each according to his abilities, to each according to his needs.” The ‘needs’ or support economy (also distributed capitalism and other tagged names) then is another way of philosophers or sociologists or economists or bureaucrats saying we are shifting to this little c vision without anyone actually needing to inform taxpayers or use either the alarming c word or the notorious M name. A few weeks ago (Dec. 11, 2013) the US National Research Council and UK (Economic and Social Research Council) released a joint report called “Subjective Well-Being: Measuring Happiness, Suffering, and Other Dimensions of Experience.” When governments decide to shift the “focus of economic measurement from production [i.e. consumer choices] toward people’s well-being,” that is a significant enabler of stealthily shifting to a needs economy. Especially when there is to be a focus on “equality, sustainability and nonmarket dimensions of well-being that cannot be captured well by conventional ‘objective’ means.” We could add that all that data on youth from digital learning will prove useful here, but let’s stick to the actual report for now. It wants to have the feds measuring the experienced (hedonic) well-being (ExWB). Now that mouthful term means that the governments now want insights into the “emotional states and experiences of people belonging to different groups.” With those insights, factors like “long-term unemployment, depression, or lack of income” that are shown to be drivers of long-term suffering can supposedly be reduced. Because LBJ’s Great Society policies turned out so well. The idea is also that positive experiences can be enhanced or increased. Yes, ‘enhance’ was the word used and this could easily turn into a parody with the catch-phrase “I’m from the government and I’m here to help,” but the intentions are quite serious. The feds also want to evaluate the purpose or purposelessness in people’s experiences so that they do not miss what the report regards as ‘crucial,’ ‘central drivers of behavior’. Going into 2014, let’s keep in mind the intentions described in that report which are clearly laying the ground work for attempts at extraordinary levels of social engineering for the future. Think of it as teed up in the dark away from prying eyes that could ring an alarm. We were quietly lurking in the outfield though and have caught what was intended to be a most troubling concept. Now we get to frame sought 2014 policies through the “lens” of making Subjective Well-Being the domain of governments in the 21st century. As if we are all merely wards of the state in need of constant oversight. Now for that second admission we can make great use of in 2014. We have long known that the accreditors answered to UNESCO and intend to use education to drive cultural change. We also knew that UNESCO globally is the driver of all the tremendous changes in higher ed. We have suspected UNESCO is the driver of K-12 reforms globally including the US Common Core, but I have been looking for the proverbial indisputable link beyond UNESCO being a named partner in the global 21st century skills movement. I now have that proof downloaded and hard copied along with UNESCO’s desired global curriculum and methods. Helpfully available on CD-ROM so with digital learning we parents will never see it. Here’s the really fun part, UNESCO says it has, since 2002, been addressing education reforms with “renewed vigour” because it serves as the “Task Manager of Chapter 36 of Agenda 21.” So much for people who consider any mention of Agenda 21 to be proof you are a “conspiracy theorist.” It appears that the Paris-based UNESCO bureaucrats and their supporters have clearly been the ones theorizing how to best conspire and with the aid of our money and children. The stated aim is “the educational strategies and action plans at all levels and sectors of education in all countries.” All means all, folks. UNESCO also confirmed what many of us have long suspected. The International Baccalaureate Organization is working hand in hand with it in implementing Chapter 36 of Agenda 21 in unsuspecting schools and districts. Frames the true intentions behind that IB Learner Profile, doesn’t it? In this time when we commemorate Peace on Earth and Good Will Toward Men, I think we actually enhance our chances of ultimately getting there in as many places as possible through awareness of what the UN is actually up to in our classrooms through the aid of ambitious local administrators and oblivious politicians. I now have the needed proof of all those connections and aspirations. And with those brief disclosures I wish everyone a Merry Christmas and a Happy New Year!! What Happens When Sovereign Political Powers Get to Dictate the Way People Should Behave in the Future? Years ago the Frankfurt School researchers stumbled upon a useful fact. Once people have heard the same pitch or story from someone they view as authoritative about five times or so, most people simply come to accept the pitch as true whether it is or not. Now as you can imagine, given the stated Frankfurter aim of altering the nature of Western culture towards a more collectivist orientation, this key point (from the Radio Project work if you want to look it up) became a Masterful Manipulation 101 strategy to be used for transformative political and social change. I think whoever was creating the broad outline of points to be pushed at last week’s (co)lab in Atlanta knew all about the Radio Project research. As Harvard’s new Innovation Fellow Tony Wagner put it, perhaps not realizing someone was taking notes so determinedly, “we need to prime the adults for the change needed” and we need to “create the consensus necessary to preserve this change once it is introduced.” So what was the vision being pushed at (co)lab in addition to King’s ‘beloved community’ we talked about in the last post? Since the head of the US Council of Competitiveness, Deborah Wince-Smith, said the inaugural (co)lab is “going to be transformative for our country,” we really ought to know what is in store for us. It’s this new social and economic vision that requires a new ‘revolutionary’ vision of education as Ken Robinson called it. A vision of the future that requires us to be able to “think differently in the future” in order to meet that revolution and “do things in a different way.” Minds that are “responsive and flexible” so they can “adapt to a world of change” is how Sir Ken described it. Of course he also really liked the vision of change laid out in that Fulton district conversion charter and said so, which may well mean it will be coming to a community near you soon. Yikes! So if Ms Wince-Smith is right and (co)lab was about Atlanta getting ready to “pioneer new policies and models for our nation,” what might we all expect? Well, the retired head of Ernst Young said it was part of what is the “most profound geoeconomic shift in history.” Of course, he also said that this push started at the World Economic Forum in Davos about 3 or 4 years ago and was being pushed by CEOs globally. The dramatic changes sought were not just in “education but also infrastructure, transportation, and logistics.” In other words, a boondoggle for globally-operating, politically-connected, established businesses which is probably why it looks so much like Corporatism and authority capitalism. In case you are getting worried that State capitalism is not a place where mass prosperity has ever reigned no matter how many times Statist professors utter the word ‘innovation’, one of the urban planning speakers informed us that “it was not the government deciding this is the future,” but rather “government plus nonprofits and business all together.” Feel better? Me neither but apparently a solid knowledge of history that recognized what comparable visions were called back in the 30s was in short supply. Or people who would have gasped in horror at the comment that “every half century we reinvent the paradigm for how communities should exist.” No, when planners and politicians make that call historically it never works out well. Someone is unfamiliar with the tragedies of Urban Renewal in the 60s in an earlier version of this state planning vision or the Chinese Ghost Cities of the present. Of course in this vision pretty soon any concept of private property goes away in function if not name since private property has always ultimately been about having a “Do Not Enter” personal zone that even a king could not infringe upon without consent. In this new vision, as we will see with ed in a minute, there is no more sphere that the political sovereign cannot try to direct or remake. Personal ‘sensibilities’ and ‘dispositions’ become the stated subject of needed change and more than one speaker also said that. You can only have private property in a society that has established the primacy of the rule of law and respect for the rights of individuals. As we have seen repeatedly, both of those are areas under coordinated attack by this new ‘revolutionary’ vision of education. Probably because they are impediments to the beloved community society with its new economy. With federal dollars targeted directly to so many urban areas apparently all things are now possible. I don’t think so but this is in fact the vision attached to all these ed reforms this blog has painstakingly laid out. Getting new kinds of minds and new ‘sensibilities’ and ‘dispositions’ is precisely why we keep encountering such a psychological emphasis as the real theory of how to close the achievement gap in a way that allows all children to ‘learn’ in a definition tied to behavioral change. Now I happen to think both the social and economic vision as well as the education reforms laid out will be toxic. But I do recognize the vision for ed being laid out by the speakers. Beyond Uncle Karl and John Dewey, it is the vision we have described from 1962 that Abraham Maslow and Carl Rogers laid out as the new focus. It’s both where Psychosynthesis and the OECD’s Competency/Robert Kegan focus go when you peel away the misleading references to the PISA ‘test’. Now let me explain why all roads and pathways always lead back to a Curriculum of Affect. In 1970 the Ford Foundation (which also was and is a huge funder of Urban Renewal and Regional Equity visions) published a book called Toward Humanistic Education: A Curriculum of Affect. It complained bitterly that when the focus of education and teaching was on subject matter–what you and I would call content knowledge–it did not “necessarily affect behavior“. And therefore people’s attitudes and actions “with regard to social injustice” needed to be changed in ways that would provoke desired actions. So school should become about discovering “the feelings, fears, and wishes that move pupils emotionally, that can more effectively engage pupils from any background.” By the way, that page kindly cites to Maslow and Rogers for doing research in this area. What are the odds? What a coincidence. More than 40 years later that seems to be the real purpose of (co)lab, that TED-x City 2.0 conference, AND the actual education reforms being hidden as connected to the Common Core implementation. That certainly is a graphic title but this is a declaration filled, how we can use education to change the future and the nature of our economy and political structures, post. Once again I am shocked with what flowed out from a little pondering over known facts. We have talked about community organizer Harry Boyte and his cooperative commonwealth vision before. But that was before we knew the White House Office of Public Engagement formally asked him to help use higher ed to shape the American Commonwealth Partnership, ACP, in 2012. When I looked into that troubling coordination further, I discovered that ACP had been announced at the same January 10, 2012 ceremony where the troubling A Crucible Moment report http://www.invisibleserfscollar.com/college-ready-as-a-goal-of-k-12-is-not-helpful-if-first-you-gut-the-historic-purpose-of-college/ was unveiled. Boyte goes back to John Dewey to lay out his vision for the future of education and the new workplace. Let’s pick it up to see what our students are to be taught as Essential Learning Outcomes that they will then carry into adult life. Harry knows that the way to get at K-12 is through mandates on colleges and universities. An invisible trickling down from the nature of the ed degrees and college coursework. As he laid out in this 1999 Wingspread Declaration http://www.compact.org/wp-content/uploads/2009/04/wingspread_declaration.pdf Notice the desire to put that document back into operation in April 2009. What changed? Maybe Race to the Top commencing? Reading Boyte’s January 2012 plans to reinvent citizenship via our K-12 AND colleges and universities sent me looking at democracyu.wordpress.com. The official website. But as you can see it was a shortlived site and it went inactive back in January just after the 2nd Inaugural. The last post was Boyte’s “Marching Orders from Martin.” As you can see Harry sees his work with the White House and federal DoEd as an example of the kind of changing of social institutions necessary for the Civil Rights Movement to finally obtain its long-sought equality of fact in economic and political relations. Now I had read about Italian communist Antonio Gramsci advocating in the 20s a March through the Institutions to gain control over the West. But Boyte is not talking about a theory for control. He is saying this is finally happening. See why social and emotional learning are so important? Even if this Administration has to misread federal disabilities and civil rights laws and impose Positive School Climate Executive Orders? The Whole Child? See why EdLeader 21 districts and Catholic private schools are pushing Daniel Pink’s vacuous A Whole New Mind so hard? Unaware Pink is simply obscuring the same political vision he used in his speech-writing career for Al Gore. That’s a lot of transformation to be hiding invisibly in education. The one social institution that virtually everyone passes through for an extended period. During the part of their life when their personality and values are the most malleable. The great tragedy of this vision from 1965 is what we now know. That urban school districts have been willing to engage in systematic mind arson to keep an aggrieved coalition in play. It has taken a long time but this vision is finally fully in motion. And it is the well functioning suburban schools that must be taken down to get to this equality of fact. It is solid colleges and universities being told to make civic engagement and life experience the focus. Community of Learners (CoL) is a phrase that first came on my radar when a new high school principal who prided himself on being a Change Agent kept mentioning it. Sandwiched in between troubling references to the teachers “may no longer teach or lecture” and “students should construct their own learning.” So the term was on my radar screen as probable trouble in a way that most parents or community leaders or politicians are unlikely to pick up on. My guess is the first time any of you or the political decision makers hear of a CoL or its earlier name, Collaborative Classroom, will be something along the lines of the way Lee S Shulman, the President of the Carnegie Foundation for the Advancement of Teaching and another Stanford prof, described it. He called it a “pedagogic reform”–“Fostering a Community of Learners.” My comments are in brackets. Now, minus my snarkiness or inserted explanations prompting a recall of earlier points in previous posts, this explanation of a reform might sound pretty convincing. Especially if sold as a means to decrease the drop-out rate by increasing student engagement. You can bet this would come with all the university presidents and business people who think it is a wonderful idea. 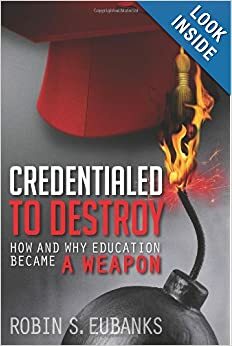 Left out of course would be the fact that the higher ed accreditation agencies required the change in the classroom and probably pushed the “independent” endorsement of FCL to boot. Or that virtually all the businesses being cited for support have some undisclosed conflict or are looking forward to being a designated vendor of a NEED in a hoped-for new kind of Capitalism as we have talked about. So I see things differently because I understand more pertinent facts than what is typically supplied by the sales campaign for these education or economic reforms. And those of you who are hearing horror stories (finally!!) about the new Common Core Science Standards and its emphasis on consensus science, remember Carnegie financed those standards. So the real point of FCL is pertinent to the real point of those Science Standards. Which is to replace objective, experimental Science as a body of disprovable knowledge. Instead we are to get experience knowledge grounded in personal perspectives. As you can appreciate Experience Science is much more susceptible to influence from political power. Very convenient in a hoped for government-led economy of the future. Now what Shulman and others advocating CoLs as a key component now of Effective Teaching and Classrooms and Positive School Climates and Cultures are likely to leave out is that this is yet another export from the Soviet Union from the time of the Cold War. Professor Bronfenbrenner was not the only American prof dropping in on Soviet psychologist Leon’tiev for some advice on how to teach American students in the future. Then Harvard Ed Prof Courtney Cazden just happens to mention in her book Classroom Discourse: The Language of Art and Teaching that FCL came from observations of a mid-70s trip to the USSR she and Professor Ann Brown and Professor Michael Cole took. The late Ann Brown is considered to be the creator of the US version of FCL along with her husband Joe Campione. She grounded it explicitly in the theories of Soviet psychologist Lev Vygotsky who we have talked about before. He was trying to come up with a way to create the perfect Soviet personality for the future. The FCL Project is described as a “system of interactive activities designed to create a self-consciously active and reflective learning environment.” Which sounds ever so much like the actual intentions for the Common Core classroom all over the globe now when you read the documents the insiders send to each other on what they wish to achieve. That last part really got my attention as another one of the books being cited to push for a different kind of economic system to go with these ed reforms is called The Spirit Society imported from the UK. Plus Zuboff described her distributed capitalism in terms of using education to infuse the desired spirit. We seem to have a consistent theme and desire going here. Yes that is the real reason Gifted programs and tracking are being discontinued. Those fine minds and excellent vocabularies and outside school experiences become common property of the classroom. To be accessible to everyone instead of the talented students moving on in the subject-based, abstract world they are capable of and may prefer. That would be selfish in our hoped for economic democracy where everyone’s needs come first and individualism is no longer a concept to be cherished or even accepted. See Cazden’s colleague James Paul Gee’s rejection of even the concept in an earlier post. Like Boyte’s Cooperative Commonwealth or Zuboff’s distributed capitalism or Otto Scharmer’s Capitalism 3.0? Every time we peel away the cover of the rhetoric intended to be the sales campaign about the US Common Core and its related education reforms globally, we find these radical Transformative intentions. Cole says “Culture is exteriorized mind; mind is interiorized culture.” So if you make the classroom about social interaction and the use of a visually-oriented external thinking devices like Smartphone or tablets like an IPad, the hoped-for change is the student’s mind from the inside out. Hopefully largely empty of accurate facts. Do that to enough students, especially making the activities about emotionally provocative or insoluble complex world problems, and you can change the prevailing culture. Can you see why I see the reality of the Common Core so much differently? It is all there once you treat education reform like an onion and peel away the rhetoric. And track back to the actual creators of these implementation practices.